The Sedona International Film Festival is proud to present the Northern Arizona premiere of the critically-acclaimed new film “Wildlife” Nov. 23-27 at the Mary D. Fisher Theatre. “Wildlife” — starring Carey Mulligan and Jake Gyllenhaal — has been a hit with critics and audiences in prestigious film festivals around the world, including Sundance, Cannes, Toronto and New York. Fourteen-year-old Joe is the only child of Jeanette and Jerry — a housewife and a golf pro — in a small town in 1960s Montana. Nearby, an uncontrolled forest fire rages close to the Canadian border, and when Jerry loses his job — and his sense of purpose — he decides to join the cause of fighting the fire, leaving his wife and son to fend for themselves. Suddenly forced into the role of an adult, Joe witnesses his mother’s struggle as she tries to keep her head above water. Actor Paul Dano makes an impressive debut as a filmmaker and — along with co-writer Zoe Kazan — elegantly adapts Richard Ford’s novel of the same name. Carey Mulligan delivers one of her finest performances as a complex woman whose self-determination and self-involvement disrupts the values and expectations of the 1960s nuclear family. 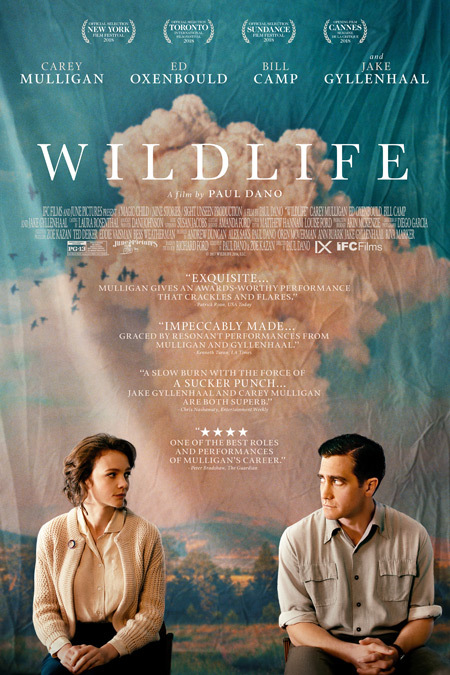 “Wildlife” will be shown at the Mary D. Fisher Theatre Nov. 23-27. Showtimes will be 4 and 7 p.m. on Friday, Nov. 23; 4 p.m. on Saturday and Monday, Nov. 24 and 26; and 7 p.m. on Tuesday, Nov. 27.